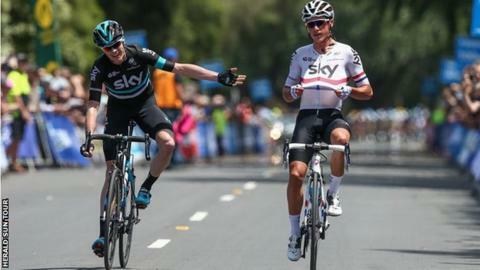 Britain's Peter Kennaugh won the opening stage of the Herald Sun Tour in Australia, leading home Chris Froome in a Team Sky one-two. The pair attacked on the category-one climb to Toolangi and then held off a chasing pack of 29 riders to win by 17 seconds at the finish in Healesville. The win gave the Isle of Man rider a seven-second advantage over Froome. It was the 26-year-old's second victory in five days after he won the Cadel Evans Great Ocean Road Race on Sunday. The Manx racer and current British champion said: "The race last week gave us quite a bit of confidence going into today. "We had a plan for today's stage which worked out absolutely perfectly. "Massive thanks to the team and especially to Froomey because once I got across to him I pretty much just sat on his wheel the whole way up the climb, then once I got over I was able to do some good turns and take it to the finish with him," Kennaugh said. Two-time Tour de France champion Froome said he was happy to play the role of "key lieutenant" for team-mate Kennaugh. "It's a really nice feeling being able to give something back to Peter," he added. "The number of times he's emptied himself for me out on the road - and he's been part of both my Tour de France victories - so it's nice to be able to do something for him. "We're going to try and protect that [lead] now." The five-day event finishes at Arthurs Seat, Victoria on Sunday.